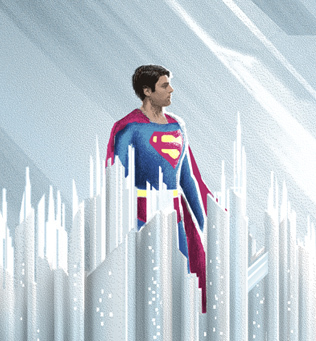 Hello my friends- Welcome to the "SON OF KRYPTON" (Solitude #2) onsale. Just click the ADD TO CART button below to purchase. UPDATE 6.2.2016 - After an epic mis-routing trip around the country, the Krypton prints have finally arrived... we're shipping like madmen and all orders should be shipped out by Monday. -As always, if you have any problems with an order just shoot me a message. WHERE: Come back here at 2PM EST and I'll make a new post with purchase buttons/info. All I remember is stumbling back to the studio in a kind of mild fury, resentful of the way this film had treated my beloved hero. So I did as I often do, sought solace in the past- threw in the 1978 movie and filled my thoughts with Reeve, Ford, Brando, data crystals and classic suit colors. Watching Superman the Movie for the 500th time, I was again inspired by Jor-El’s sacrifice and lessons, by Pa Kent’s quiet wisdom, by Clark’s extreme kindness even when faced with personal suffering and fear. Over the course of those 2 hours everything else fell away, and Superman became a hero again. Thanks to Germain Lussier and Io9 for the reveal.